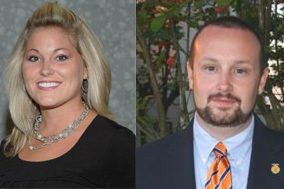 Strom Thurmond Career and Technology Center faculty members Darla Steele and Jeremy Brooks have been named South Carolina Mid-State Region Outstanding Agricultural Education Teachers of the Year for 2013 by the South Carolina Association of Agricultural Educators. Darla who is in her fifth year as agricultural education instructor at the career and technology center was named the regions Outstanding Young Agriculture Teacher and Jeremy, who is in his twelfth year as an agricultural education instructor was named the regions Outstanding Agriculture Teacher. Dr. Steele and Mr. Brooks were selected for these prestigious awards at the fall meeting of the South Carolina Association of Agricultural Educators (SCAAE) held in Winnsboro South Carolina. Both teachers will now compete against three other regional winners in each category to secure the honor of being named the Outstanding Young Agricultural Educator and the Outstanding Agricultural Educator for the state of South Carolina.